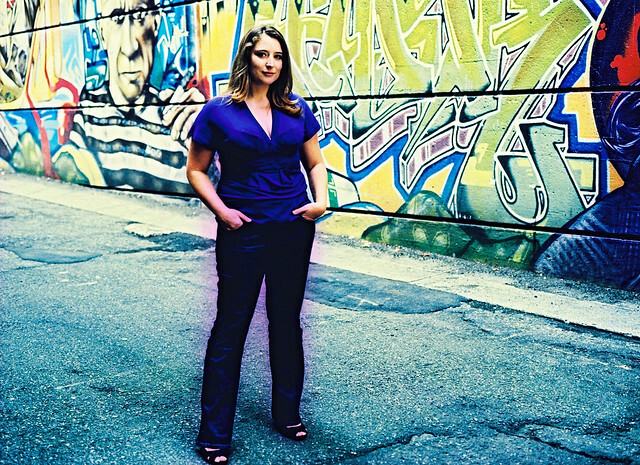 Vancouver blogger Rebecca Bollwitt, AKA “Miss604” grew up here in Surrey. She is an inspiration to us and has been supportive of our Surrey blog. Although she built her first website in 1997, Rebecca has been blogging about life in BC since 2004 on Miss604.com, and podcasting since 2005. Originally from Surrey BC, Rebecca has been working professional in online media (from corporate webcasting to news dissemination) for the last 11 years. Rebecca co-founded sixty4media, a WordPress website development firm, and has co-authored the book, Blogging to Drive Business. Rebecca was a finalist for Woman Entrepreneur of the Year in 2009 (Impact Entrepreneur Group) and was named one of BC’s Top 100 Women of Influence by the Vancouver Sun in 2010. Miss604.com was voted “Best Vancouver Blog” by the Georgia Straight for 2009, 2010 and 2011, “Best Local Blog” by The Westender in 2010 & 2011, and has been ranked within the top ten blogs in Canada (by PostRank). She was also voted “Best Twitter User” in 2010 and 2011 by readers of the Georgia Straight. Miss604.com is currently nominated in the 2011 Canadian Blog Awards for “Best Place Blog” and “Best Written Blog”. Rebecca is on the selection committee for the Sport BC Athlete of the Year Awards and the Heritage Vancouver ‘Places that Matter’ campaign. She is the Vancouver organizer of Twestival, and Blogathon – both annual social media events for charity that have raised over $30,000 for global and local causes since 2007. She is also a (unpaid) spokesperson for the Cadbury Bicycle Factory that has donated over 9,000 bikes to rural communities in Ghana and a member of the Canadian Red Cross Twitter Team. Rebecca is a partner and sponsor of the YWCA Women of Distinction Awards.